At the Tiana Bayside Marine Center grand opening June 28. 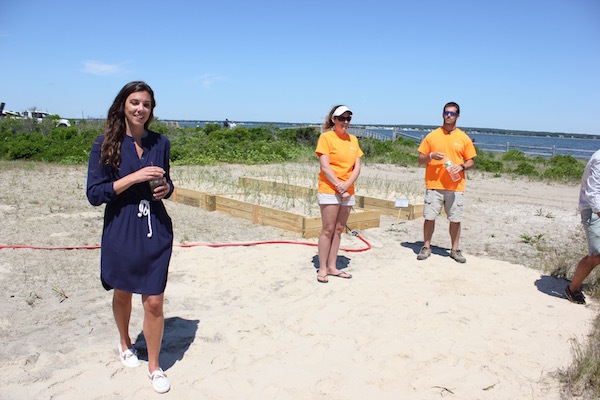 Southampton Town and Cornell Cooperative Extension of Suffolk County’s Marine Program unveiled their new center for marine education, restoration and stewardship at Tiana Bay in Hampton Bays June 28. The Tiana Bayside Facility, on Dune Road across from Tiana Beach, will be operated by CCE’s researchers and educators, who will provide public marine and environmental educational activities. SPAT Program director Kim Tetrault, with SPAT’s community oyster garden to the left. CCE’s Suffolk Project in Aquacultue Training has been using the site as a community shellfish nursery for several years, and that program will be expanded with the opening of a former police barracks on the property as a classroom. Mr. Tetrault added that oysters are amazing creatures who “clean water like you wouldn’t believe” from the day they begin feeding. 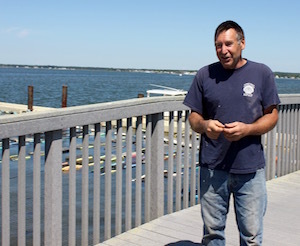 “We know the direction to go, but we can’t do it without people who have the knowledge and experience,” said Town Supervisor Jay Schneiderman, who stood beside Mr. Tetrault on the dock overlooking SPAT’s oyster nursery. The grounds are the site of a coastal plant nursery growing native coastal plant species for shoreline restoration projects, and CCE staff hope to start a seahorse conservation initiative and do horseshoe crab monitoring there. 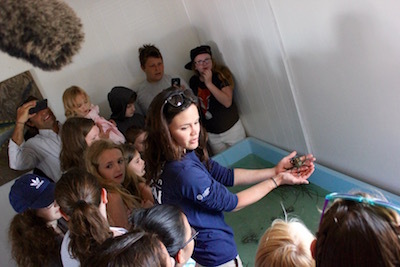 Marine Program Educator Rachel Neville gave a tour of CCE’s touch tank. Marine Program Outreach Manager Kim Barbour said the building will be open for CCE programs offered through the town’s recreation department, and they also hope to have the building, with nautical art exhibits and and a marine touch tank, open to the public on Monday, Wednesday and Friday afternoon. They also plan to host marsh and birdwatching walks there. She also said CCE’s fisheries team will be working from the site on projects with the Shinnecock fishing fleet just east on Dune Road. 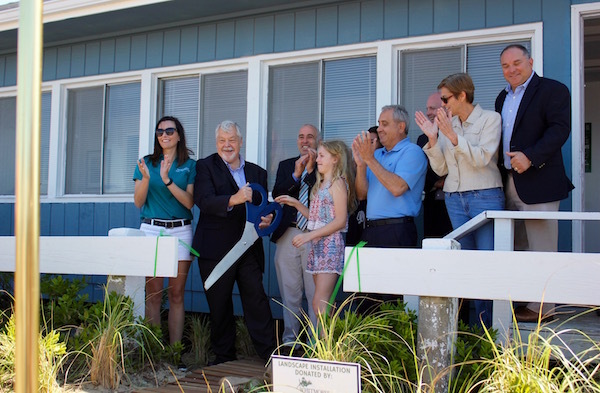 The building is the first Southampton Town facility to be powered by rooftop solar panels, installed by local renewable energy company GreenLogic, and the town plans a wind energy pilot program at the site. CCE Executive Director Vito Minei said he was encouraged by the several dozen teenagers and children who showed up for the opening. “You’re critical to the future here,” he told them. “This brings the community together. There’s a future for you, literally, in saving the bays of eastern Long Island. “The Tiana Bayside Facility is the first of many future town commitments to restore our water quality through aquaculture, education and community participation,” said Councilman John Bouvier, a member of the SPAT program at the site, who helped facilitate the joint project between CCE and the town. Marine Program Outreach Manager Kim Barbour, Habitat Restoration Program Educator Kim Manzo and Habitat Restoration Program Technician Jason Havelin explain their work propagating marine plants for restoration projects at the site.